Google announced at today’s hardware event it was creating a smart home display called Google Home Hub. 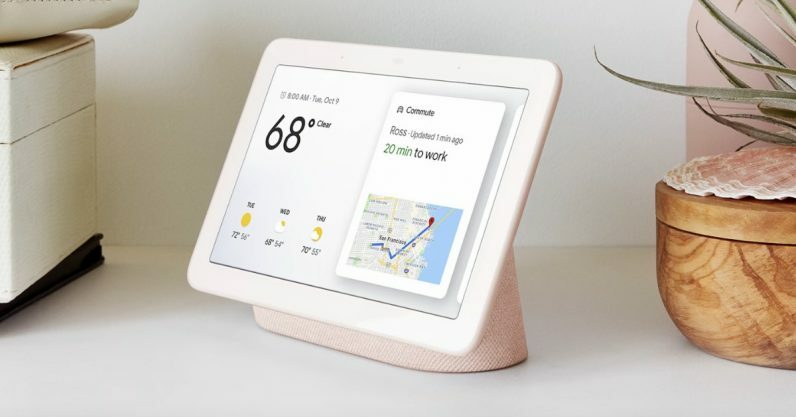 This device marries its Google Home smart speaker with a tablet interface. The Hub looks very much like the Echo Show, or the recently-announced Facebook Portal. As shown in the pre-event leaks, it comes with a 7-inch touchscreen with a speaker base in pink, white, grey, and green. Diya Jolly, Google‘s VP of Product Management, said its major goal with the Hub was to make a device that’s comfortable to use in the home. To that end, the Hub won’t have a camera. The screen will also automatically adjust to the light in the room, so that it doesn’t have a garish glow in a dimly-lit space. The Hub is designed to be used by multiple people, according to Jolly. It can differentiate between voices and offer personalized responses to questions. It also offers Home View, a dashboard that shows information about all smart devices in the home, as well as offering room-specific controls. Google also announced integration with Nest devices, such as the smart doorbell and thermostat — both of which can be controlled from the Hub. In addition, the Hub can be turned into a photo frame when it’s not directly in use. Specifically, it can display Live Albums, automatically-updated albums of loved ones selected from your Google Photos by AI. The Google Home Hub can be pre-ordered today for $149. It’ll be available on September 27.